WDBF was “born” in the Fall of 2013 when Jovan Mrvos, a local resident, discovered that the FCC was opening up the low powered (LP) spectrum of the FM band. The last time that the FCC opened up the spectrum for new licenses was in 2001. Applications for a license were open to non-profits, religious organizations, and educational facilities. The North Adams Community Schools school board gave approval for license application in November 2013. The application was filed and approved by the FCC in Feb. 2014. The license holder is North Adams Community School Corp.
Fundraising began and the local community responded enthusiastically. 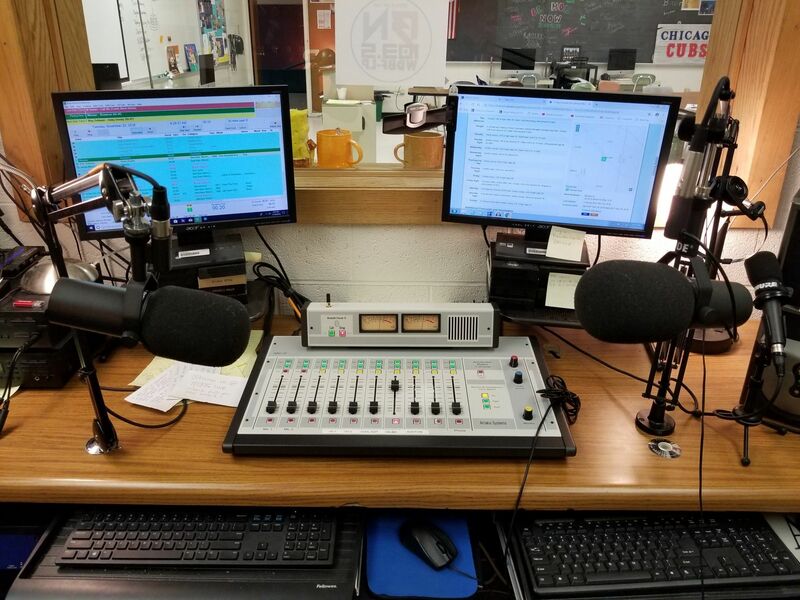 The station went on the air full-time with student staff in November 2016. The station broadcasts 24 hours a day, seven days a week. FCC license requires that the station broadcast during school hours/school days, but because we have automation software, it allows us to broadcast non-stop. WDBF is a truly student-run station. Like a commercial station, we have management roles that are responsible for the day-to-day operations with Jovan Mrvos being the “adult in the room” serving as the General Manager. Our staff includes six on-air staff who also have additional responsibilities, such as Music Director, Program Director, Production Director, and soon we hope to add Sales Manager. WDBF is indebted to our Legacy Underwriters who contributed all the funds to launch the station. We are also deeply indebted to Jim Crocker of Rockford, Ohio. We truly would not be on the air without his tireless efforts in getting us up and running. Thanks from all of us, Jim. We are also grateful for the support of Ms. Kim Hiatt, Principal of Bellmont High School; Mr. Brent Lehman, Superintendent of North Adams Community Schools; and Mr. Ben Faurote, President of the North Adams School Board. The following companies and individuals contributed critical funds that ensured that we would be able to not only launch, but could sustain the program until long-term funding was in place. And finally, we would not be able to expand our dream into the digital realm without the generous financial support of Chuck and Lisa Surack and the Sweetwater Family of Companies. Hi, I'm Lance and host of "Transition Tempos" 9am-1am Mon-Fri. I'm a Freshman at Bellmont High School. My favorite thing about being a member of The Brave Nation staff is learning all the new things and how interesting it all is. What I want to do after high school is going on to Culinary School and then opening and owning my own restaurant. Hi, my name is Parker Braun. I am your on air DJ from 3-5pm M-F. In addition to being on the air, I'm also this year's Program Director and also the Sports Director. My duties at the station are vast, but I couldn't do it without the help of our great staff and my APD, Gabby. When I'm not on the air, you can find me participating as a member of Student Council, National Honors Society, TSA (Technology Student Assoc.) and Bellmont Early College. I also play two varsity sports: Tennis and Track & Field. Looking forward to the future, I will be attending Purdue Fort Wayne and majoring in Marketing. Because of the outstanding college courses that Bellmont offers and in addition to online courses offerd by Ivy Tech, I will be entering college needing only to complete two years of courses to earn my Bachelor's Degree. My end goal is to enter the field of Medical Device Sales. Throughout the last two years, radio has allowed me not only to reach but connect to a larger audience and that's you, the listeners. You are The Brave Nation. Without you, I wouldn't be able to share my passion for music and sports on a daily basis and for that, Thank You from me and the rest of The Brave Nation Family. And keep it dialed into 103.5 FM and 1035.live!!! Hi, I'm Hope Gerber, this year's Music Director. The things I enjoy most about radio is being able to participate in local broadcasting and having the opportunity to share my voice with the community. After high school, I plan to go to IUPUI and major in Art History. The new "Wrecking Crew" the 2018-`19 Brave Nation Airstaff! "The thing that I enjoy most about radio is the fact that I can have my own voice on my show. I also enjoy that my personality/voice reaches a broader audience than just my peers. The best part , by far, is that my grandma is able to live far from me and still listen to my show every day online. After highschool, I want to attend Indiana State University and major in Elementery Education. I hope to return to Decatur to teach here and influence the young children in our community." "My name is Logan Rogers. I'm a senior at Bellmont High School. My favorite thing about working on the station is coming up with lame jokes to make at least one person smile. My plans after high school are to hopefully go to college and earn my Bachelor of Fine Arts degree and persue a career in acting."